The children of Israel traveled through the Sinai wilderness. The following story is given in Numbers 21. Jesus referenced this story in John 3. The Book of Mormon provides additional insight. And he (The Lord) did straiten them in the wilderness with his rod; for they hardened their hearts, even as ye have; and the Lord straitened them because of their iniquity. He sent fiery flying serpents among them; and after they were bitten he prepared a way that they might be healed; and the labor which they had to perform was to look; and because of the simpleness of the way, or the easiness of it, there were many who perished. And now, my brethren, I have spoken plainly that ye cannot err. And as the Lord God liveth that brought Israel up out of the land of Egypt, and gave unto Moses power that he should heal the nations after they had been bitten by the poisonous serpents, if they would cast their eyes unto the serpent which he did raise up before them, and also gave him power that he should smite the rock and the water should come forth; yea, behold I say unto you, that as these things are true, and as the Lord God liveth, there is none other name given under heaven save it be this Jesus Christ, of which I have spoken, whereby man can be saved. Yea, did he not bear record that the Son of God should come? And as he lifted up the brazen serpent in the wilderness, even so shall he be lifted up who should come. And as many as should look upon that serpent should live, even so as many as should look upon the Son of God with faith, having a contrite spirit, might live, even unto that life which is eternal. Jesus Christ took upon himself the sins of the world in the Garden of Gethsemane and on the Cross at Calvary. 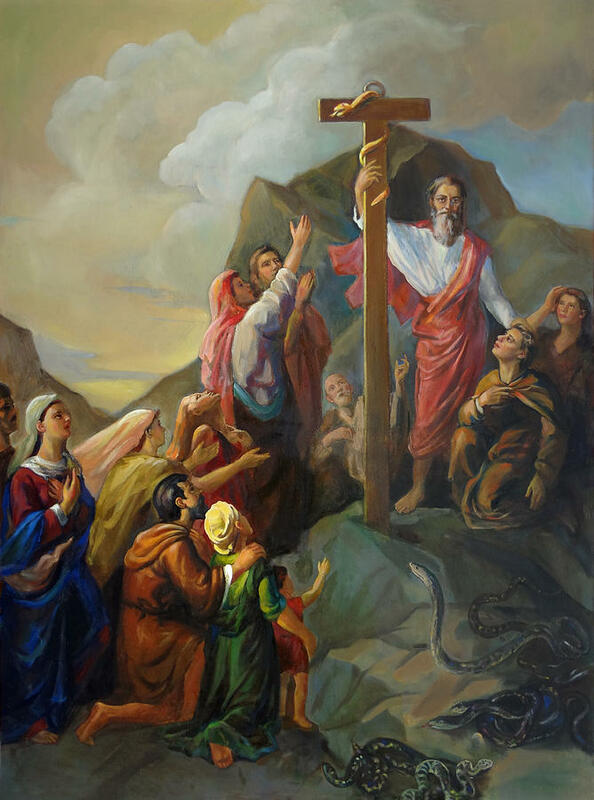 The serpent on Moses’ pole represented these sins. The pole symbolized Jesus’ cross. Perhaps we are all like the complaining children of Israel sometimes. I admit my own guilt in this regard. We must thank the Lord every day for the blessings that he has given us. We must confess and repent of our sins. Then the Lord will heal us from our wounds.